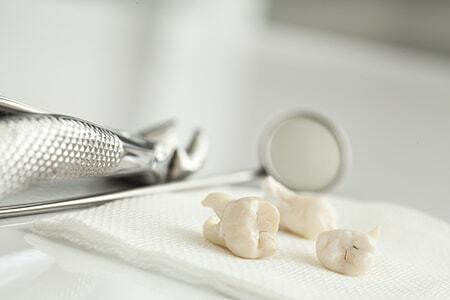 Wisdom teeth are the last adult teeth to emerge and can be difficult to detect without x-rays. Many patients in Kennesaw, GA are unaware that third molars are growing underneath the gums. Misaligned or impacted wisdom teeth can cause problems for many individuals if not treated. At 32 Dental, we can take out wisdom teeth to prevent issues. Misaligned wisdom teeth are those that emerge at an angle either toward or away from the teeth. Impacted wisdom teeth are those that don’t erupt or partially erupt due to lack of space. At 32 Dental, we recommend that most patients have their wisdom teeth removed in the mid-late adolescent years if they haven’t already started to erupt through the gums. During this time, the roots are not fully developed, which makes the extraction and recovery easier. As patients get older, the roots begin to grow longer, which can increase the risk of complications with the procedure. Before your extraction, we perform a thorough exam along with x-rays and 3D imaging to allow us to determine the size and position of the wisdom teeth. The extraction is an outpatient procedure that can be done with sedation if desired. Following your extraction, it is normal to experience swelling and mild discomfort. We will provide after-care instructions to improve comfort and minimize side effects. If you are in the Kennesaw, GA area and would like more information about wisdom tooth extractions, call us at 770-423-1132.